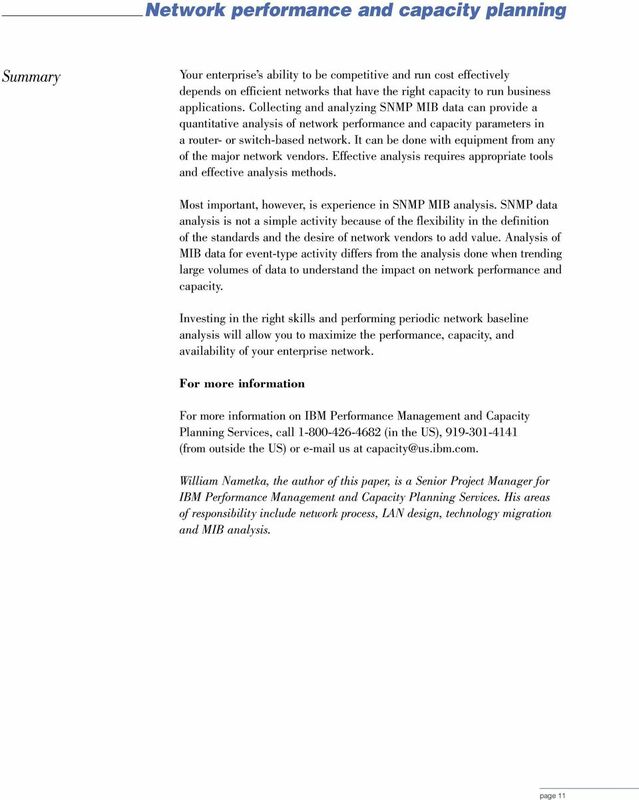 Download "Network performance and capacity planning: Techniques for an e-business world"
1 IBM Global Services Network performance and capacity planning: Techniques for an e-business world e-business is about transforming key business processes with Internet technologies. In an e-business world, networks are the heart of your business. Baseline analysis requirements Rapid response times. High availability. Adequate bandwidth. 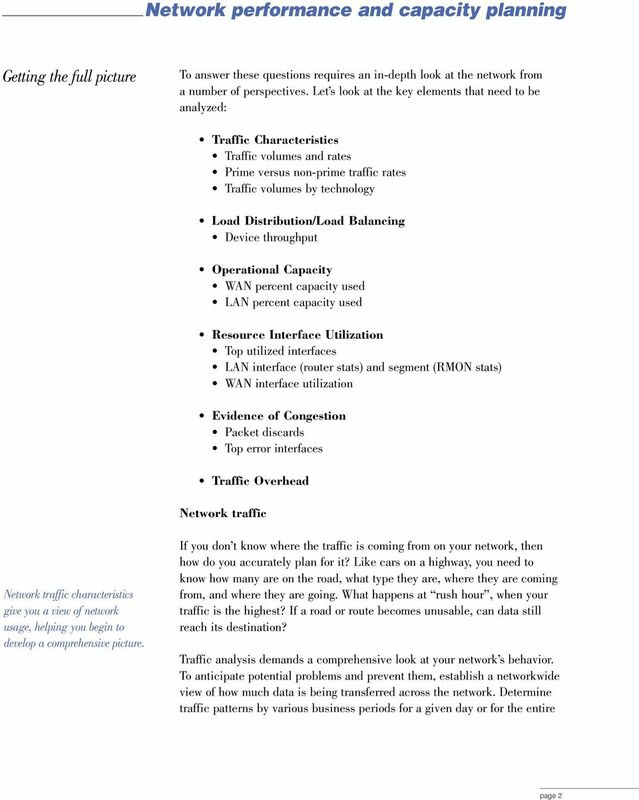 These are the demands placed on your business networks. Fueled by an explosion of e-business and remote access requirements, the performance of your network today directly affects your customer s first impression of you, and therefore your business success, more than ever before. 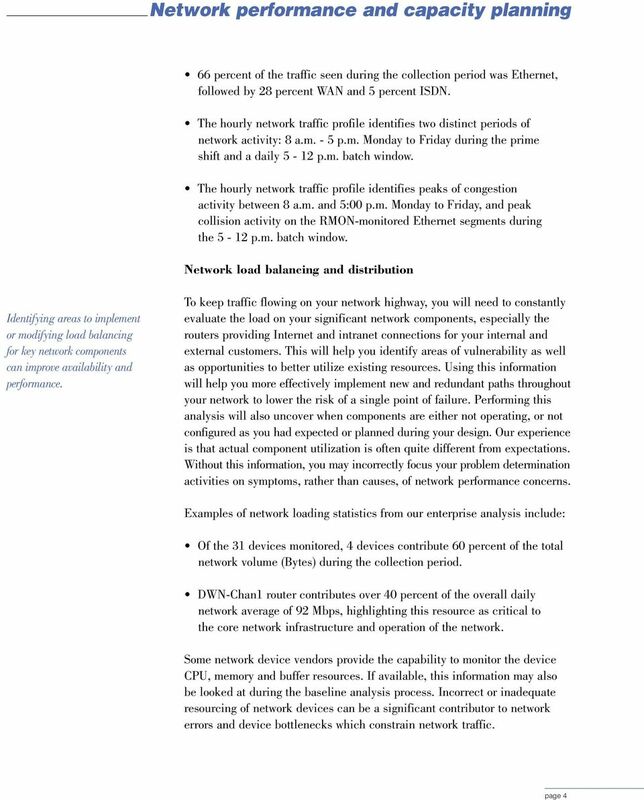 Effective network baseline analysis gives you the ability to improve and maintain performance of your existing networks as well as make informed design and purchase decisions as you grow. 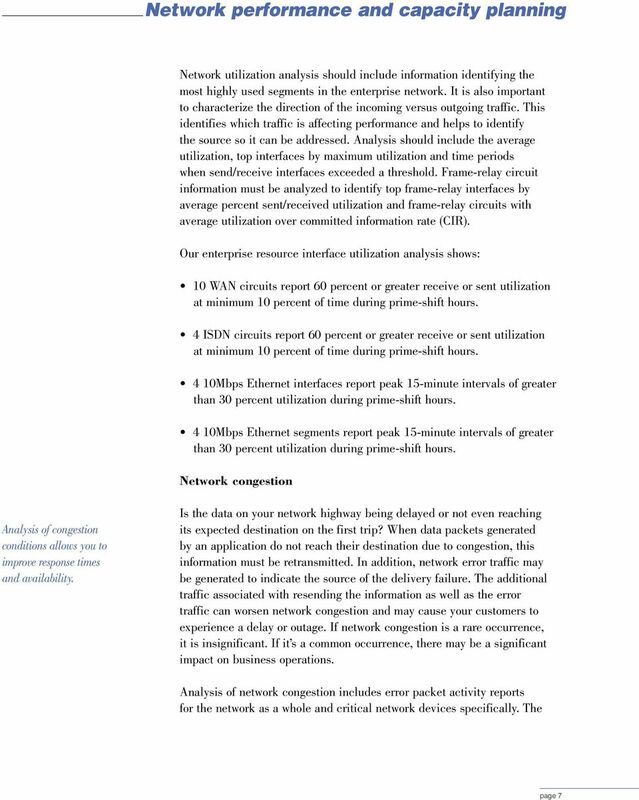 Effective network capacity planning doesn t always translate to, Buy more bandwidth. 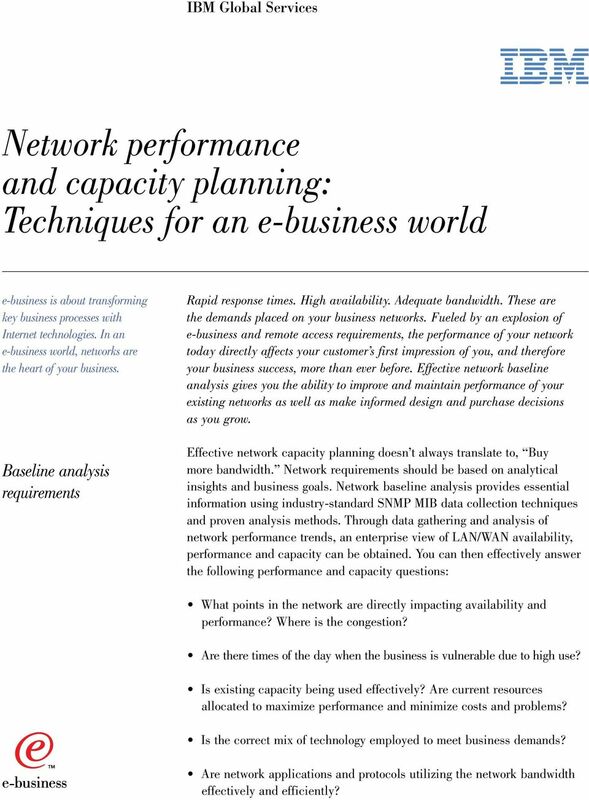 Network requirements should be based on analytical insights and business goals. 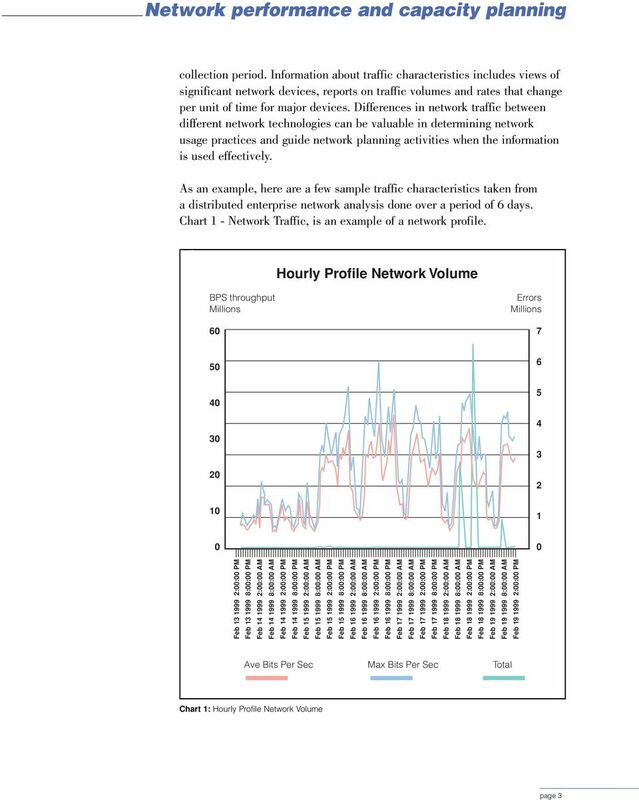 Network baseline analysis provides essential information using industry-standard SNMP MIB data collection techniques and proven analysis methods. 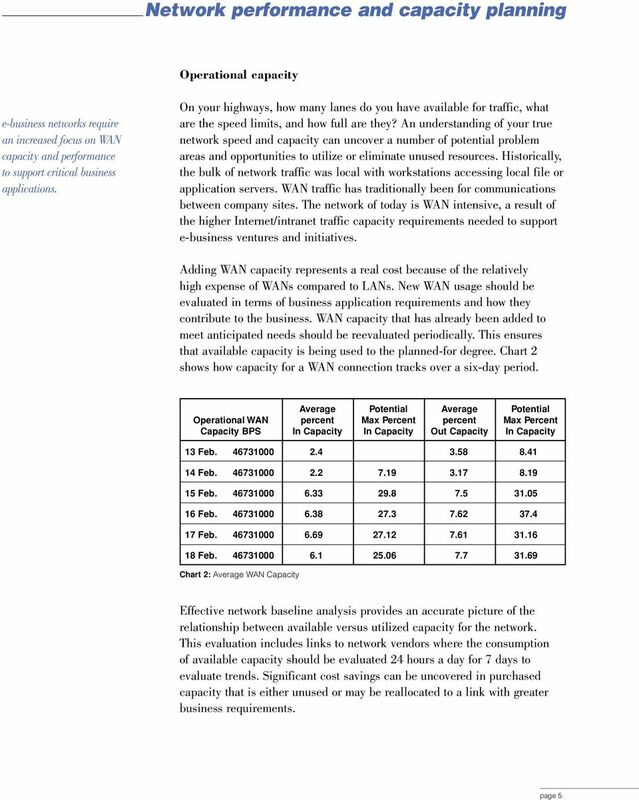 Through data gathering and analysis of network performance trends, an enterprise view of LAN/WAN availability, performance and capacity can be obtained. 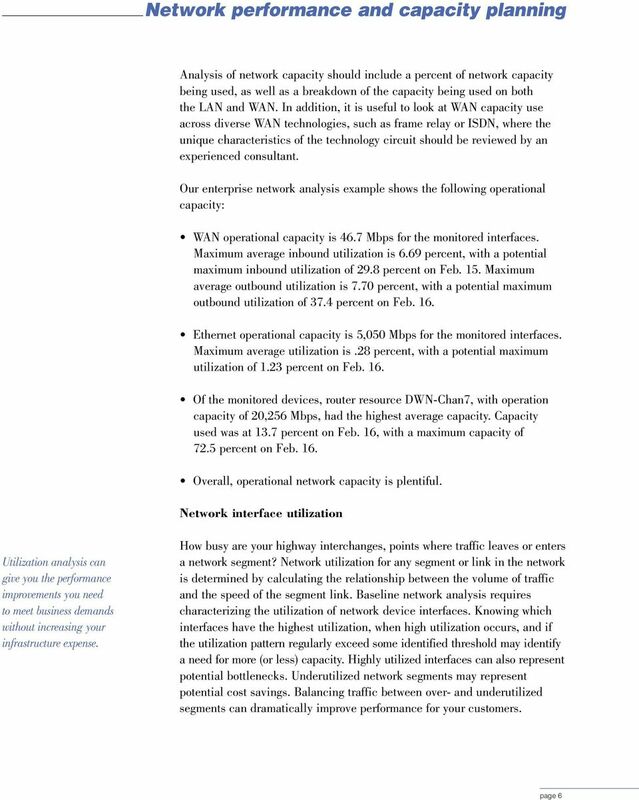 You can then effectively answer the following performance and capacity questions: What points in the network are directly impacting availability and performance? Where is the congestion? Are there times of the day when the business is vulnerable due to high use? Is existing capacity being used effectively? Are current resources allocated to maximize performance and minimize costs and problems? Is the correct mix of technology employed to meet business demands? 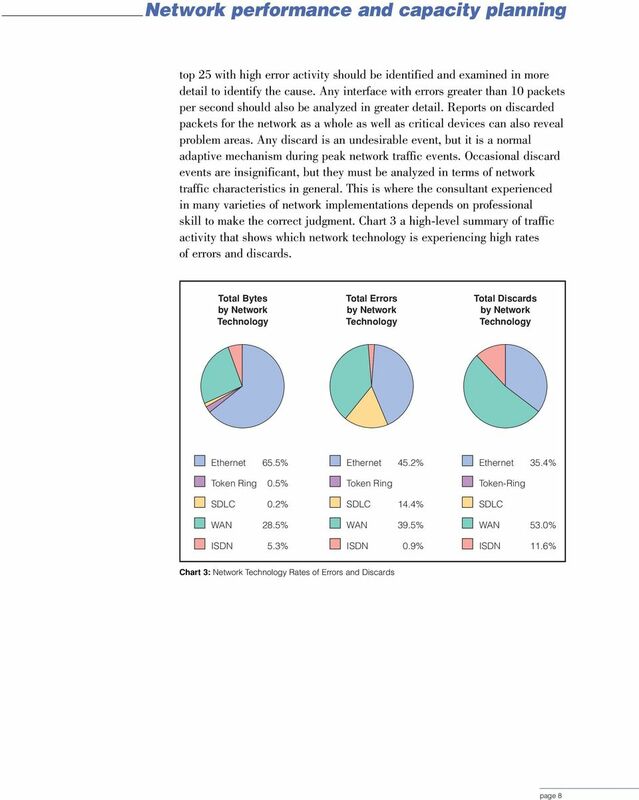 Are network applications and protocols utilizing the network bandwidth effectively and efficiently? Solving complex performance problems in TCP/IP and SNA environments. 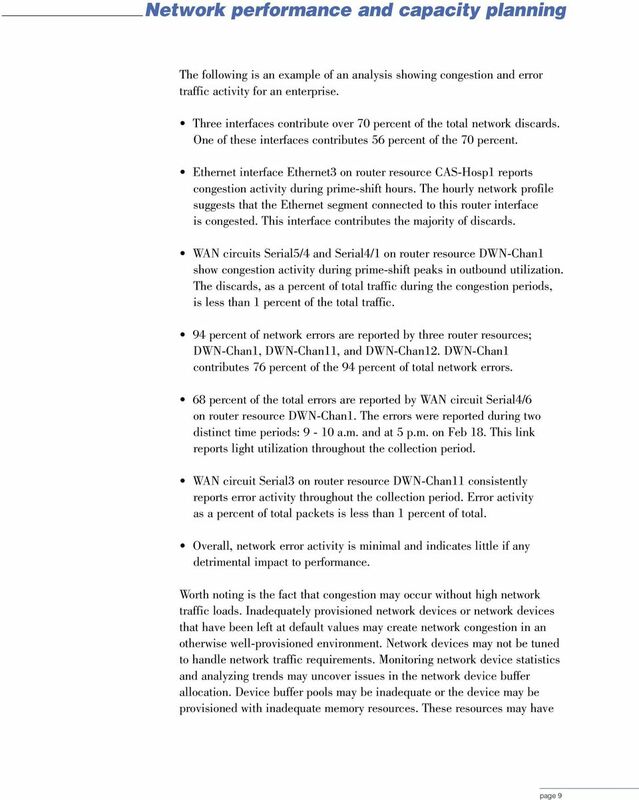 How Much Broadcast and Multicast Traffic Should I Allow in My Network? ICND2 NetFlow. Question 1. 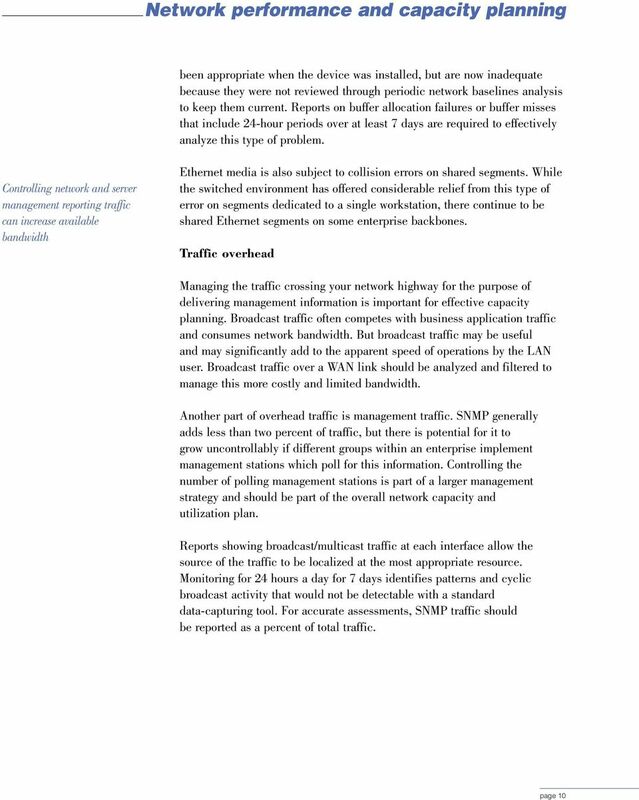 What are the benefit of using Netflow? (Choose three) A. Network, Application & User Monitoring. B.
CCNA R&S: Introduction to Networks Chapter 5: Ethernet 5.0.1.1 Introduction The OSI physical layer provides the means to transport the bits that make up a data link layer frame across the network media. Top 10 Tips for z/os Network Performance Monitoring with OMEGAMON. Ernie Gilman IBM. August 10, 2011: 1:30 PM-2:30 PM. Top 10 Tips for z/os Network Performance Monitoring with OMEGAMON Ernie Gilman IBM August 10, 2011: 1:30 PM-2:30 PM Session 9917 Agenda Overview of OMEGAMON for Mainframe Networks FP3 and z/os 1.12 1.